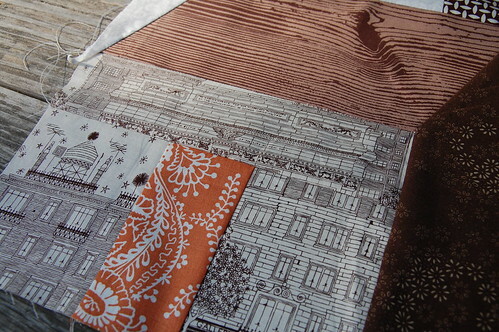 I’ve added another block to my new brown, orange and grey sampler quilt. 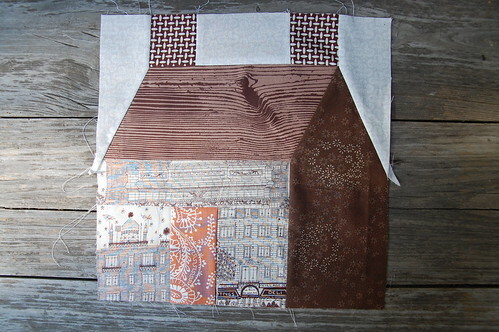 The schoolhouse block is very traditional block that makes a really fun quilt when repeated. One thing I especially love about quilting, is that every block teaches you a new technique or trick. Schoolhouse block has intersecting angles, which when you learn from someone like Johanna are a piece of cake to master. I really like the playful illusions you created here! can’t stop looking at it… And your intersecting angles are seriously neat. I adore your use of fabrics for this. The woodgrain roof is just lovely. I love this block! The fabrics you chose are perfect – with the windows, so cute! 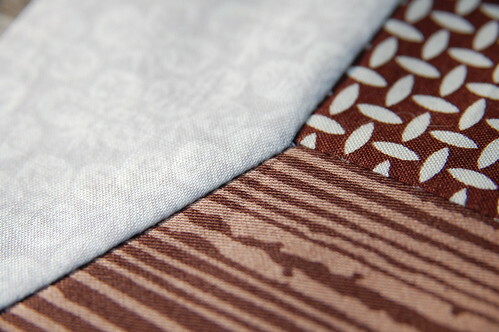 I have to echo what everyone else has said: the fabrics you chose are gorgeous. I think they really “make” it. This is so beautiful, I think you could frame that schoolhouse block. Inspiring. I love everything about this, it’s so perfectly beautiful!